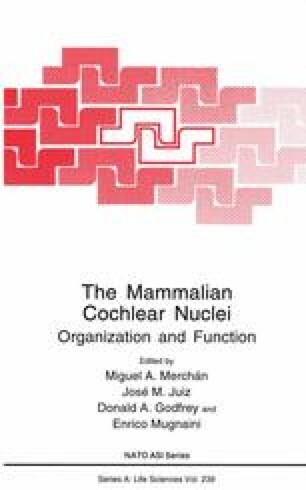 Acoustic information, encoded in the cochlea and conveyed to the cochlear nucleus (CN) by cochlear nerve fibers, is processed by cell groups in the CN. Inhibitory neurotransmission appears to play a prominent role at this level of auditory processing (Brugge and Geisler,’ 78; Voight and Young,’ 80; Caspary et al., this volume). Information has been emerging recently with regard to the location and transmitters of the inhibitory neurons which synapse in the CN. These neurons may originate in other brain stem nuclei that project to the CN, or could lie within the CN itself (Saint Marie et al.,’ 91, this volume; Oertel and Wickesberg, this volume). These inhibitory projections probably use the amino acid transmitters, glycine and GABA at their synapses in the CN (Whitfield and Comis,’ 66; Tachibana and Kuriyama,’ 74; Fex and Wenthold,’ 76; Fisher and Davies,’ 76; Godfrey et al,’ 77,’ 78; Caspary et al,’ 79; Wenthold,’ 79; Martin et al,’ 82).